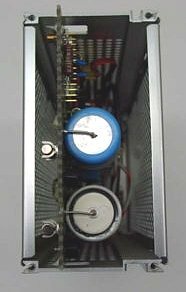 The AM 503 is a plug-in modular current-probe amplifier that operates in TM 500 Mainframes. 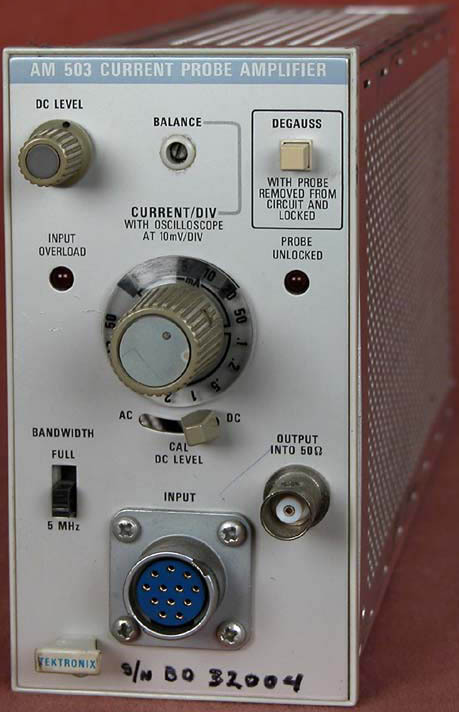 It allows display of current/division on any oscilloscope with 10 mV/div sensitivity, 50 ohm or 1 megohm input, and (for performance to full specifications) at least 100 MHz bandpass. The amplifier attenuator is calibrated in 12 steps with a 1, 2, 5 sequence, and the knob-skirt is illuminated to indicate current per division. The current range, maximum current rating, and bandwidth are determined by the particular probe in use. Bandwidth can be set to FULL (where it is limited by the probe in use) or to 5 MHz. Coupling may be switch selected to ac or dc. Ac coupling offers a convenient means of measuring low-amplitude ac signals on a high-level dc current. 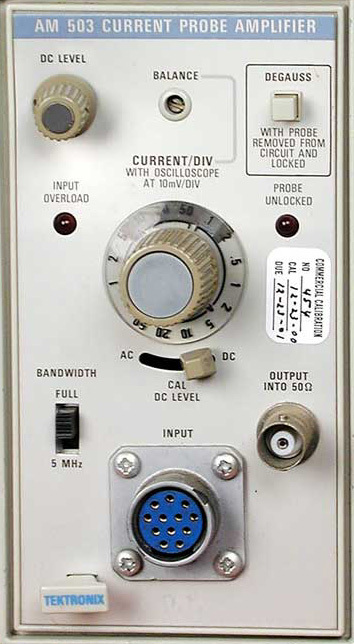 A front-panel indicator warns of input current overload. When a P6302 Current Probe is used with the AM 503 Current-Probe Amplifier, the current range is from 1 mA/div to 5 A/div. Maximum current is 20 A peak (dc + peak ac). Peak pulse maximum is 50 A not to exceed a product of 100 A μs. And bandwidth is dc to 50 MHz. The probe operates through inductive coupling with no electrical contact. A flick of your forefinger operates the sliding jaw in the insulated probe tip. Just put the probe tip around the conductor under test for immediate current readings.